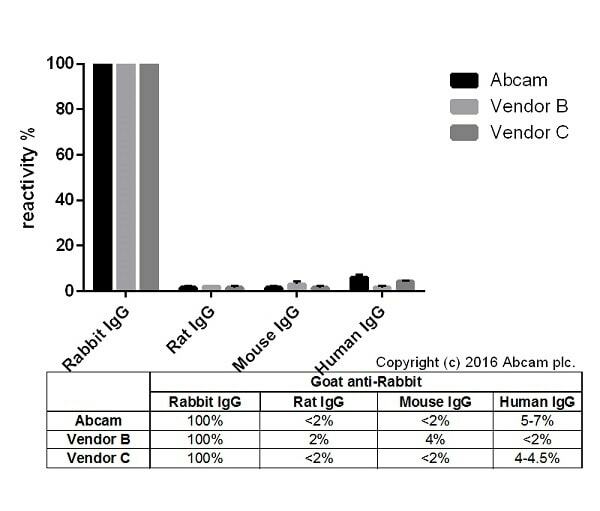 The antibody used for conjugation reacts with rabbit immunoglobulins of all classes. 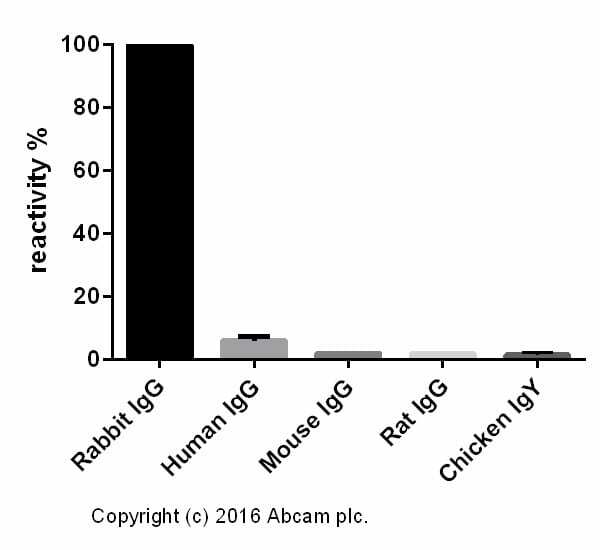 Cross-reactions as determined by ELISA for the unconjugated antibody (ab182016): Mouse IgG, rat IgG, and chicken IgY, less than 2%. Human IgG, less than 7%. 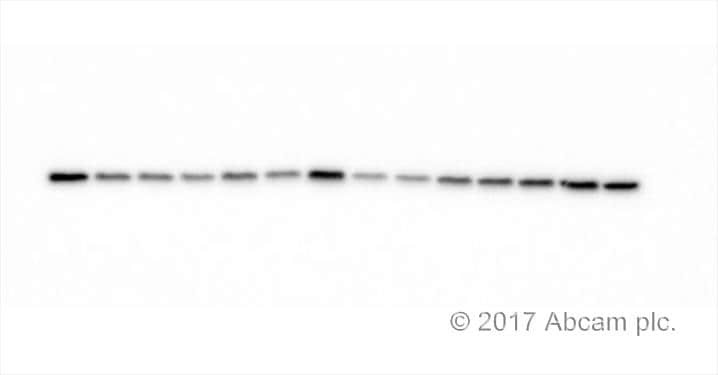 This antibody was isolated by affinity chromatography using antigen coupled to agarose beads and conjugated to Horse Radish Peroxidase (HRP). Our Abpromise guarantee covers the use of ab205718 in the following tested applications. This blot was produced using a 4-12% Bis-tris gel under the MOPS buffer system. The gel was run at 200V for 50 minutes before being transferred onto a Nitrocellulose membrane at 30V for 70 minutes. The membrane was then blocked for an hour using 2% Bovine Serum Albumin before being incubated with ab8227 overnight at 4°C. Antibody binding was detected using ab205718, and visualised using ECL development solution ab133406. IHC image of histone H4 staining in a section of formalin-fixed paraffin-embedded normal human colon tissue*. The section was pre-treated using pressure cooker heat mediated antigen retrieval with sodium citrate buffer (pH6) for 30mins, and incubated overnight at +4°C with ab177840 at 1/1000 dilution. An HRP-conjugated secondary (Ab205718, 1/20000 dilution) was used to detect the primary for 1hr at room temperature. DAB was used as the chromogen (ab103723), diluted 1/100 and incubated for 10min at room temperature. The section was counterstained with haematoxylin and mounted with DPX. The inset negative control image is taken from an identical assay without primary antibody. All lanes : ab205718 (Left Image) at 1/20,000 and a competitor secondary (Right Image) at 1/50,000. Notice the increased background of the competitor product. This blot was produced using a 4-12% Bis-tris gel under the MOPS buffer system. The gel was run at 200V for 50 minutes before being transferred onto a Nitrocellulose membrane at 30V for 70 minutes. The membrane was then blocked for an hour using 2% Bovine Serum Albumin before being incubated with ab8227 overnight at 4°C. Antibody binding was detected using ab205718 (Left Image) and a competitor secondary (Right Image), and visualised using ECL development solution ab133406. This blot was produced using a 4-12% Bis-tris gel under the MOPS buffer system. The gel was run at 200V for 50 minutes before being transferred onto a Nitrocellulose membrane at 30V for 70 minutes. The membrane was incubated overnight with 2% Bovine Serum Albumin at 4°C. Any non-specific background binding was assessed by incubating the membrane with only the secondary antibody (ab205718), and visualised using ECL development solution ab133406. IHC image of beta tubulin staining in a section of formalin-fixed paraffin-embedded normal human colon tissue*. The section was pre-treated using pressure cooker heat mediated antigen retrieval with sodium citrate buffer (pH6) for 30mins, and incubated overnight at +4°C with ab6046 at 1/100 dilution. An HRP-conjugated secondary (Ab205718, 1/20000 dilution) was used to detect the primary for 1hr at room temperature. DAB was used as the chromogen (ab103723), diluted 1/100 and incubated for 10min at room temperature. The section was counterstained with haematoxylin and mounted with DPX. The inset negative control image is taken from an identical assay without primary antibody. All lanes : ab205718 (Left Image) 1/50,000 and a competitor secondary (Right Image) 1/50,000. Notice the increased background of the competitor product. This blot was produced using a 4-12% Bis-tris gel under the MOPS buffer system. The gel was run at 200V for 50 minutes before being transferred onto a Nitrocellulose membrane at 30V for 70 minutes. The membrane was incubated overnight with 2% Bovine Serum Albumin at 4°C. Any non-specific background binding was assessed by incubating the membrane with ab205718 (Left Image) and a competitor secondary (Right Image), and visualised using ECL development solution ab133406. This blot was produced using a 4-12% Bis-tris gel under the MOPS buffer system. The gel was run at 200V for 50 minutes before being transferred onto a Nitrocellulose membrane at 30V for 70 minutes. The membrane was then blocked for an hour using 3% milk before being incubated with ab68153 overnight at 4°C. Antibody binding was detected using ab205718, and visualised using ECL development solution ab133406. IHC image of Ki67 staining in a section of formalin-fixed paraffin-embedded normal human colon tissue*. The section was pre-treated using pressure cooker heat mediated antigen retrieval with sodium citrate buffer (pH6) for 30mins, and incubated overnight at +4°C with ab15580 at 1/1000 dilution. An HRP-conjugated secondary (Ab205718, 1/20000 dilution) was used to detect the primary for 1hr at room temperature. DAB was used as the chromogen (ab103723), diluted 1/100 and incubated for 10min at room temperature. The section was counterstained with haematoxylin and mounted with DPX. The inset negative control image is taken from an identical assay without primary antibody. Publishing research using ab205718? Please let us know so that we can cite the reference in this datasheet. - 20ug of bovine liver lysates were loaded on to 4-15% gradient gel. - Blocking in 5% skim milk for an hour at room temperature. 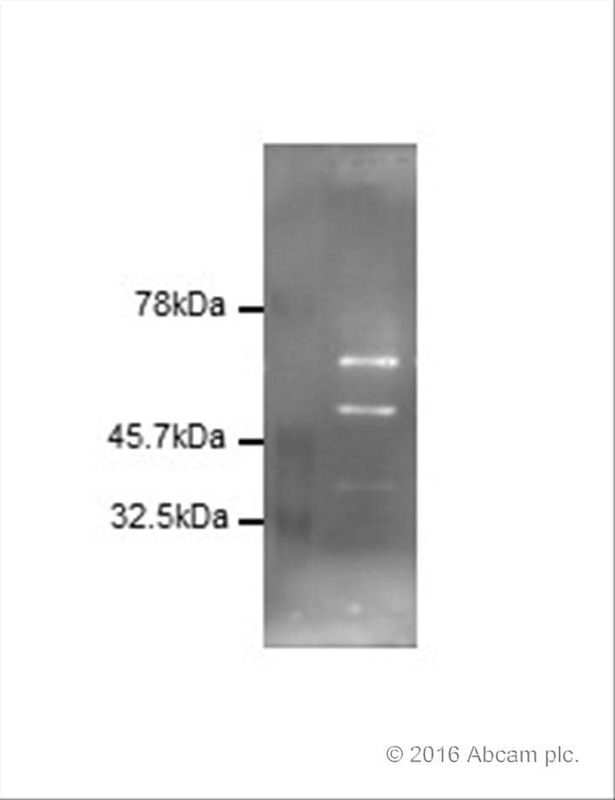 - 1:20000 secondary antibody (ab205718) used for an hour at room temperature. 10ug whole cell lysate (human ES cells). Blocking buffer - 5%BSA/1%OvAlb/PBS for 3 hours. Primary antibody - NR1D1(ab174309) 1:1000, 15 hours at 4C, expected size 67kDa. Secondary diluted in TBST (1:5000) for 3 hours at room temperature. ECL prime: 1 second exposure.